Erik Bailey of Jericho, an opponent of proposed gun legislation, speaks Tuesday night to Senate committee members at a Statehouse hearing. Vermonters used words — and colors — Tuesday night to fight, politely, over guns. Hundreds streamed into the Statehouse for a hearing held by two Senate committees, filling the House chamber and overflowing into nearby rooms to watch it remotely. Wearing green shirts and buttons were those who backed a controversial bill establishing new restrictions on guns sold privately to felons and those who are mentally unfit. In blaze orange shirts, vests, hats and stickers were those opposed to any new gun laws in Vermont. Orange far outnumbered green, but both sides expressed equal passion. “I don’t speak to you as a supporter of gun control but rather as a supporter of gun safety,” green-shirted Louise Coates of Barre said at the start off the two-and-a-half-hour hearing. “We are headed down a slippery slope toward confiscation,” countered orange-clad Bob Shea of Fairfax. Tuesday night's arguments reflected an age-old debate in Vermont. 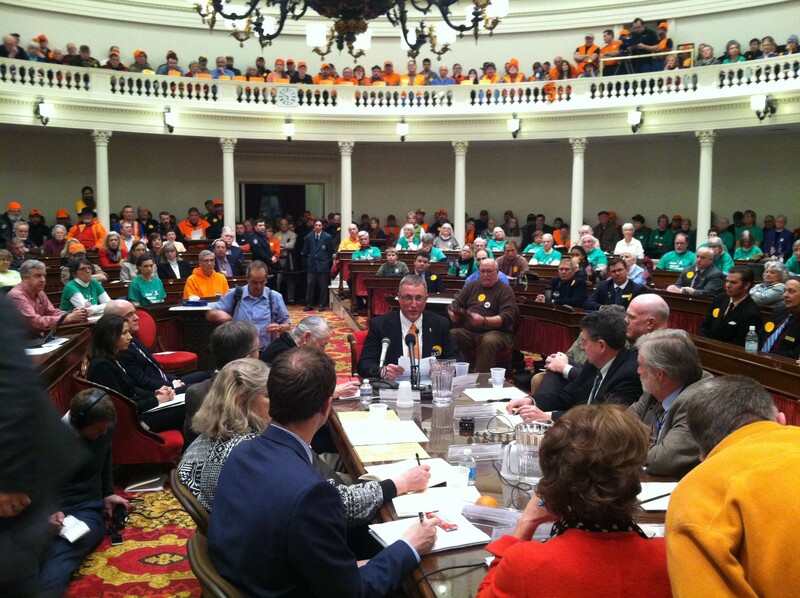 It has found new life in the legislature this year now that lawmakers are considering a bill backed by the advocacy group Gun Sense Vermont. The group formed after the 2012 Sandy Hook Elementary School shootings in Connecticut. Gov. Peter Shumlin reiterated earlier Tuesday that he sees no need to change the state's gun laws, but said, "I think these debates are healthy for Vermont." Shea reminded senators of the political peril they face if they pass new restrictions in rural, hunting-heavy Vermont. “We Vermonters know there’s going to be a roll-call vote and we have long memories,” Shea told senators. Sixty-five people signed up to speak against the bill — and 43 for it. Each had two minutes to make his or her case to 10 members of the Senate Judiciary and Health & Welfare committees. The hearing turned emotional as both sides struggled to control their strong feelings. Those with a lifelong love of guns and hunting squared off against those who see tighter laws as an important response to high-profile cases of gun violence across the country. “I’m not a violent person,” said John Burditt of Sudbury. But he said a charge filed against him after a black-ice car crash could keep him from buying a gun if the bill were to pass. Barbara Scotch of Montpelier stirred up opponents of the bill with her comments. “The gun owners who are against this bill must have something to hide,” she said. Later, when opponents of the bill applauded a speaker, Health & Welfare Committee Chair Claire Ayer (D-Addison) called a five-minute break. When she reconvened the hearing, the audience had thinned slightly.